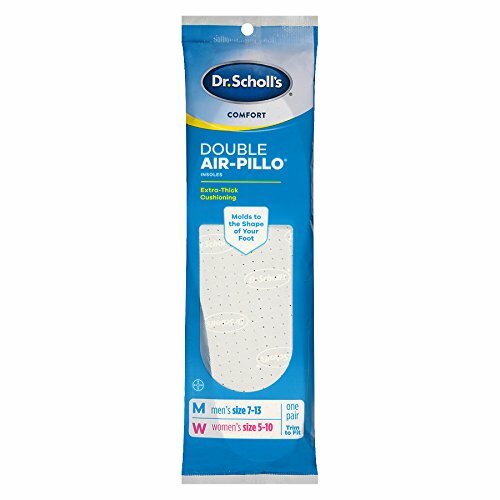 We designed Dr. Scholl’s Comfort Double Air-Pillo Insoles especially for people whose feet experience discomfort during the day. Two layers of foam deliver extra thick cushioning. Contains natural rubber latex. The package contains one pair of insoles that fits Men (sizes 7-13) and Women (sizes 5-10). 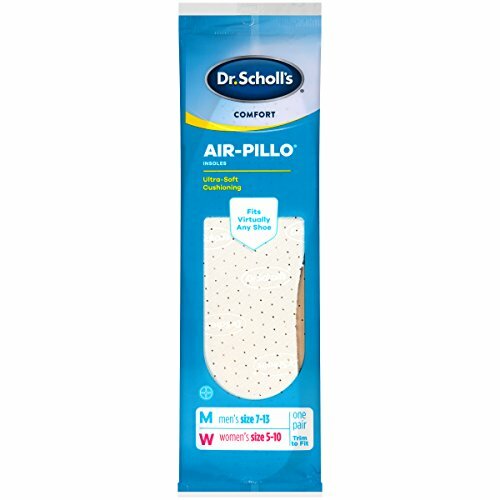 Dr. Scholl's has been a trusted brand in foot care since 1904 when Dr. William Mathias Scholl, grandson of a cobbler, launched the company under the name Dr. Scholl Inc.
We designed Dr. Scholl’s Comfort Air-Pillo Insoles especially for people whose feet experience discomfort during the day. Two layers of foam deliver ultra-soft cushioning. Contains natural rubber latex. The package contains one pair of insoles that fits Men (sizes 7-13) and Women (sizes 5-10). Dr. Scholl's has been a trusted brand in foot care since 1904 when Dr. William Mathias Scholl, grandson of a cobbler, launched the company under the name Dr. Scholl Inc.
Patented double layer system: top layer of soft cushioning foam provides long-lasting comfort; bottom layer of cushioning foam bounces back time after time. Customized Cushioning with Memory Foam: Top layer of memory foam molds to the unique shape of your foot; delivers personalized comfort where you need it most; conforms to the shape of your foot for better support and cushioning. Bottom layer of Sure Grip Foam: stays in place; provides for less wrinkling and bunching. Bottom layer bounces back time after time for long-lasting comfort. Absorbs shock. Men's sizes 7-13, women's sizes 5-10. 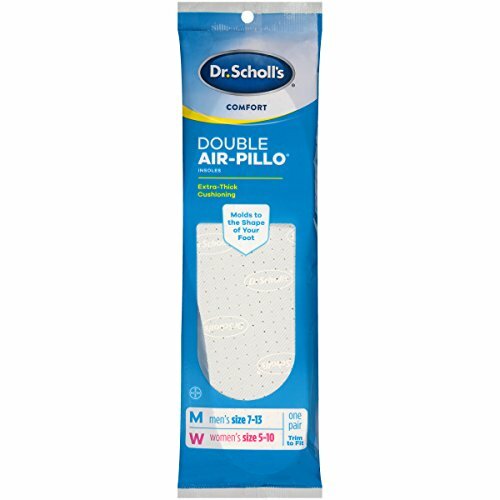 Dr. Scholl's Double Air Pillo Insoles UnisexGuaranteed comfort Excellent shoe fit Patented double layer system: o Top layer of soft cushioning foam provides all-day comfort. o Bottom layer of shock absorbing foam bounces back time after time. Made with Sure Grip Foam® for less wrinkling, bunching and slipping. With an Antimicrobial agent prevents growth of odor-causing bacteria on the topcloth. Contains natural rubber Designed for roomier shoes. Unisex fits: Women's - sizes 6-10, Trim to fit. Men's -sizes 7-13, Trim to fit.Fits:Dress Shoes Work Shoes Casual ShoesComfort Guarantee: We guarantee these insoles will provide cushioning comfort, shock absorption and fit. If you are not completely satisfied, return to Schering-Plough HealthCare Product, Inc., P.O. Box 377, Memphis , TN 38151 for replacement or refund. 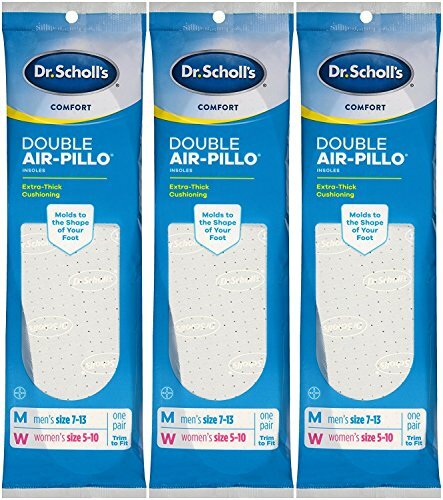 Copyright © Wholesalion.com 2019 - The Best Prices On Air Pillo Double Insoles Online.